Click the following link for a YouTube video. The California Pizza Kitchen at the mirage is not altogether unlike a stage where you can perform or at least watch others perform. The restaurant is an elevateted circular structure in the middle of an ocean of slot and video machines. 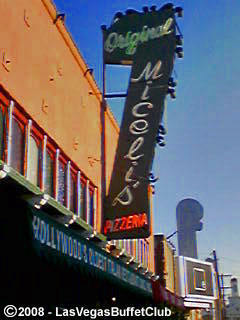 I can imagine you performing there, while I devour one of their custom pizzas or Focaccias. The One And Only Full Moon! It was another Full Moon over North America. The Oldest Continuous Marching Parade in America! To celebrate America and its discovery. To celebrate our Italian as well as the multi-cultural heritage of our magnificent nation, the United States of America. To support our community, our children and those less fortunate, through charity and creative fundraising events. To continue the great tradition of Baltimore’s Columbus Day Parade, America’s oldest parade and celebration of its kind. The parade route is north along Broadway to 39th Street, then west past the reviewing stand at Stephen R. Gregg/Hudson County/Bayonne Park at Avenue C for the conclusion of the event. At the stroke of 5 this afternoon, Cape Coral police motorcycles blared sirens and drove east on Southeast 47th Terrace, kicking off the city’s annual Columbus Day Parade. Thousands of people lined the downtown street, parallel to main thoroughfare Cape Coral Parkway, and took in the sights and sounds of the parade — a Cape Coral tradition for more than 25 years. The most common sights at the parade were American flags, followed closely by Italian flags. But with the presidential election just a little more than three weeks away, the event also took on a decidedly political tone. About halfway through the 40-minute parade were three cars bearing large signs for the Republican presidential ticket, Sen. John McCain of Arizona and Alaska Gov. Sarah Palin. About five minutes behind them were three other vehicles bearing large signs for the Democratic candidates, Sen. Barack Obama of Illinois and Sen. Joseph Biden of Delaware. Several other cars featured candidates for local offices. For the first time, the parade featured the Italian Food Festival afterward. That appeared to boost the parade’s attendance. The Sons of Italy Lodge 2507 of Port Charlotte also took part in the Cape parade. Protesters do not plan to interfere with the Columbus Day Parade on Saturday as they have in previous years. A leader of the movement to end the Columbus Day parade, said Thursday that lawyers for the protesters need a break. The same lawyers who defended the Columbus Day protesters last year – when 83 people were arrested – also represented some of the same people after arrests during the Democratic National Convention. “That’s thousands of dollars worth of legal work that’s done for us. You have to be respectful of their time and their resources,” Spagnuolo said. The Columbus Day parade begins at 10 a.m. at Court Place and 15th Street. It follows a route that circles about a half- dozen blocks and ends on Broadway. George Vendegnia, who heads the parade committee, said he can do without protests. “That would be nice,” he said. Opponents will rally instead near the Capitol before the parade, Spagnuolo said. Jackson said the opponents don’t have a parade permit, but noted they don’t need one as long as their activities remain on the sidewalk. The Denver Post calls on American Indians to Protest IF they Must, But, Do it Peacably. It also branded as “a vile and unnecessary attack” the American Indian branding the Italian-Americans who celebrate their culture and long history in Colorado that day as “racists” !!!!!!! Columbus Day Parade – Join thousands on Fifth Avenue on Monday to celebrate the contributions of New York’s Italian-American community. Admiral Edmund Giambastiani Jr. will serve as grand marshal for the procession up Fifth Avenue from 47th Street to 79th Street from noon until 3PM. “Columbus Day parade Sunday on S. Broad St.” The city will celebrate Columbus Day on Sunday with a giant parade in South Philadelphia. This year’s grand marshal is Hollywood actress Connie Stevens (born Concetta Rosalie Anna Ingoglia). The parade, which celebrates Italian culture and traditions, will start from Broad and Reed Streets at 12:15 p.m. and proceed south on Broad to Oregon Avenue and Marconi Plaza, where the Italian Festival will be held. Local streets will be closed during that time. HAMILTON — It wasn’t just Italian pride that swelled yesterday, but county pride as hundreds of area residents came out to see the Mercer County Italian-American Festival Association’s Columbus Day Parade. The day is known as Día de la Raza in much of Latin America, Discovery Day in the Bahamas, and Día de la Hispanida (Hispanic Day) in Spain. FYI – Transcontinental Interstate 10 serves the southern tier of the United States by providing the main east-west link from Santa Monica and Greater Los Angeles in the west to Jacksonville in the east. Major cities served by Interstate 10 include Los Angeles, California; Phoenix, Arizona; El Paso, Texas; San Antonio, Texas; Houston, Texas; New Orleans, Louisiana; and Jacksonville, Florida. This route is known as the Christopher Columbus Transcontinental Highway, and it is one of three coast-to-coast Interstates (the others being Interstates 80 and 90). Mario Batali’s Carnevino Steakhouse, Wolfgang Puck’s CUT Steakhouse, Emeril Lagasse’s Table Ten American Restaurant are three of the more famous names among over a dozen real snazzy joints at the Palazzo. it was Susan’s first trip to the Palazzo and she was impressed. Since I still prefer the Old-Vegas expierience, like snacking on the little burgers at the old Boardwalk food-counter after midnight – half-lit and missing you, I wasn’t as easily impressed. Ieatvegas’ latest picks for top buffets/restaurants. Ieatvegas’ latest picks for top buffets/restaurants – LasVegas. Velvet Yogurt – Self-serve Frozen Yogurt in San Clemente, CA. Uniquely appealing, light-weight Velvet Yogurt charges by the ounce. Choose the cup size you want, then choose your favorite yogurt – like Irish Mint, choose a topping – like chocolate, then add some fruit – like raspberries, then weigh it on the scale. Purchase as much or as little as you like. 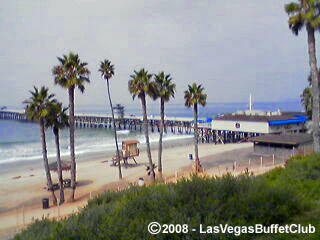 Although it has nothing to do with Velvet Yogurt, the following movie shows a clip of San Clemente’s train-depot on the beach.. 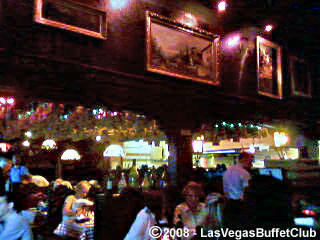 The San Lorenzo Italian Restaurant at the Texas Station Hotel served us a fine dinner. We had a delicious Eggplant Parmesan with a nice salad…Reservations are recommended, call (702) 631-1023. Tony L has been hanging out at the Tuscany Suites and Casino on Flamingo in Las Vegas. It’s rather small for Las Vegas, but the locals seem to like it. Beyond the Paul Newman thing, We had the good fortune – and good timing – to ride the train up to Silverton – at just the right time of year: the changing colors of the leaves were magnificent and the weather was perfect. 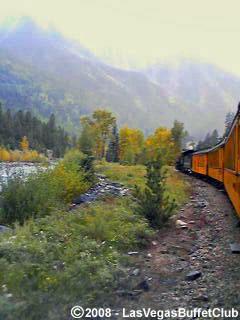 I recommend this trip, which is an all day excursion from Durango, Colorado to Silverton, Colorado on an ancient Coal/Steam, narrow-gauge train. The trip is several hours each way with a two-hour layover in Silverton, where you can walk around town, have lunch or a drink. Speaking of drinks, the train has a mess car where you can purchase food, coffee, beer and drinks. 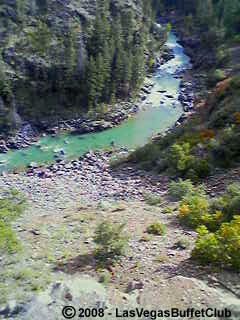 The train edges along mountain passes and follows the pristine Animas River. This is like the the perfect all-day Disney ride to the top of the mountain…Click the link for complete information, including ticket purchase.